Here are a few things to keep in mind when shopping for a new pair of sunglasses this summer. 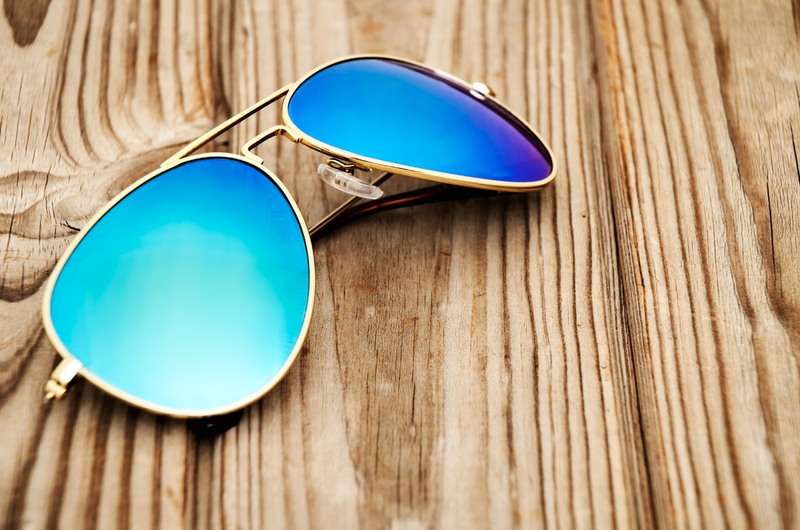 Sunglasses should screen out 75-90% of visible light. You can test to see if a particular pair of sunglasses is dark enough by trying them on in front of a mirror. If you can see your eyes easily through the lenses, they're probably too light. Wraparound styles of sunglasses offer bonus protection from the sun's UV rays. Sunglasses that wrap around the temples prevent the sun's rays from entering from the side. Some studies have shown that enough UV rays enter around standard sunglasses frames to reduce the protection offered by their lenses. Look for a uniform tint on the lenses making sure that one area is not darker than another. You can check for imperfections in the lenses by holding the glasses at arm's length and looking through them at a straight line in the distance, such as the edge of a door. Slowly move the lens across the line of the door. If the straight edge distorts, sways, moves or curves, then the lens is flawed. It's always important to remember that even the best pair of sunglasses cannot protect your eyes from certain intense light sources. Tanning lights, snowfields, arc welding or gazing directly at the sun (even during a solar eclipse) require special protection beyond that of sunglasses to prevent damage to your eyes. You may also want to take the time to consider which special features you may want or need when purchasing a new pair of shades. Mirror coatings - Thin layers of various metallic coatings on lenses can reduce the amount of visible light that enters your eyes. These types of lenses are popular in high-glare environments and when combined with the wraparound feature, they can provide added protection to the skin surrounding your eyes. Gradient - These lenses are permanently shaded from top to bottom or from top and bottom toward the middle. Single gradient lenses - which are dark on top and lighter on the bottom - can cut glare from the sky, but still allow you to see clearly below the gradient - this is especially good for driving, but not as helpful in the snow or on the beach. Double-gradient lenses - which are dark on top and bottom and lighter in the middle - may be better for sports where light reflects up off water or snow such as skiing or sailing. Polarized - Polarized lenses cut reflected glare, which is what occurs when sunlight bounces off smooth surfaces like water or pavement. These lenses can be especially helpful when driving, boating or out in the snow. Polarization is unrelated to UV protection so you will still need to ensure UV absorption of your lenses even if they're polarized. Photochromic - This is a type of lens automatically darkens in bright light and becomes lighter in low light. Although photochromic lenses may be good UV-absorbent sunglasses (again, the label should specify this), it can take a few minutes for them to adjust to different light conditions. Impact Resistant - While all sunglasses must meet minimum FDA standards in regards to impact resistance, no lens is truly shatterproof. Plastic lenses are less likely to shatter upon impact than glass lenses and polycarbonate plastic, which is used in many sports sunglasses, is even more impact resistant that regular plastic. However, polycarbonate lenses scratch very easily. If you purchase a pair of polycarbonate lenses, be sure to look for ones that have scratch-resistant coating.